On Thursday April 21st we shall make a human chain with the children of Gaza to spell out NO FLY ZONE OVER PALESTINE so as to tell the world that Israel’s bombings of Gaza must stop. he good people of the world acknowledge that Israeli planes simply flying over Palestine is an intentional source of panic and fear, of state sponsored terrorism, for countless people in Gaza, especially the children. There are kids in Gaza that wet themselves at night for fear of being bombed again when they hear Israeli aircraft overhead. And this is a nearly daily occurrence. There are children here that have seen loved ones crushed, bleeding, burned and dying, some hit with White Phosphorus, as a result of Israeli bombings. Some of these children were seriously wounded themselves. One 11-year-old girl I know personally (from the Samouni family) still has pieces of an Israeli rocket in her head from a bombing during Operation Cast Lead. To this day this injury causes her to bleed from her nose and she has other neurological issues as yet undiagnosed and unresolved. 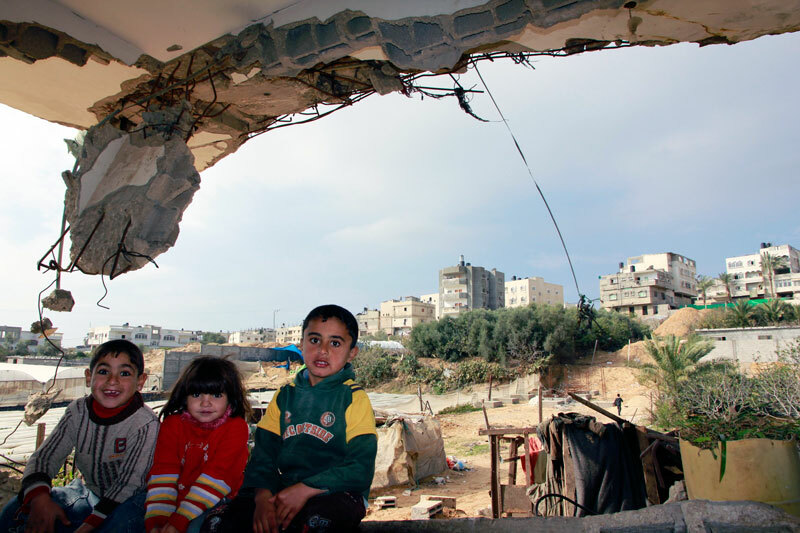 This is but one story but it makes the point that not only memories are embedded in these children forever, each time a jet, a drone or helicopter gunship flies overhead, the ongoing nightmare of what may come is re-visited. I ask every parent out there to imagine your child continuously traumatized and terrified in the name of “fighting terrorism”. Ask yourself how you would feel about being continuously bombarded by the fourth largest military in the world and having no way at all to protect your child from fear or harm? How would you feel? Now think about how you play a direct role in the terrorizing of children in Palestine if you are a UK or American citizen. Your governments continue to supply the very same weapons used to carry out these missions. Maybe you in particular should do something to stop this homegrown madness, and if you are already doing something then maybe you should do more? Make no mistake; the flying of Israeli aircraft over Palestine is in itself a form of terrorism. Bombing with “high precision” weapons that continue to hit innocent people is a war crime and terrorism; and this is happening regularly. So what the hell are we doing about it? Some may say; “what difference will a picture make?” Well I believe the picture we seek to take will make a difference. 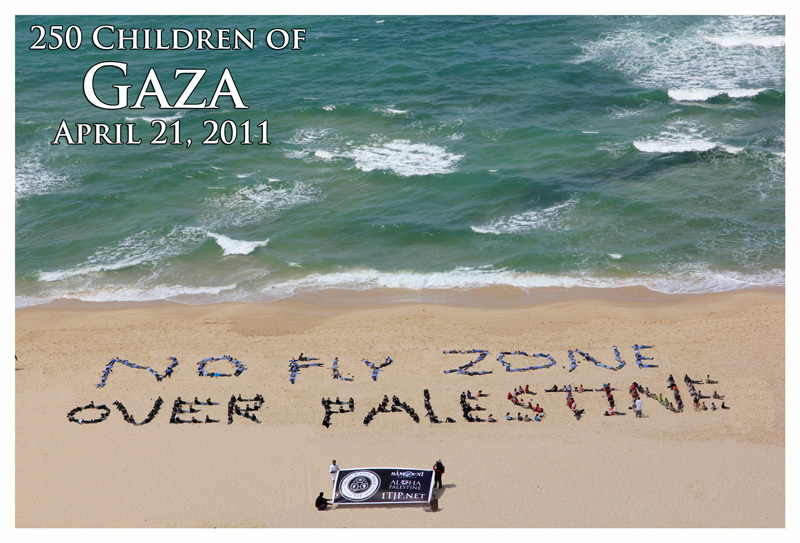 We will gather around 200 schoolchildren of Gaza on Thursday April 21, 2011 and these children will form a human chain that will spell out the words ‘NO FLY ZONE OVER GAZA’. As we do this let us face another shameful fact, the NO FLY ZONE OVER LIBYA is pure, unadulterated oil stealing hypocrisy posing as “humanitarian intervention”. If there were ever anything genuinely humane about Western intervention a NO FLY ZONE OVER PALESTINE would have been implemented decades ago. But the Palestinians have no oil, and they certainly have no air defenses, and so the innocent people of Gaza continue to be bombed with impunity. How bloody stupid, powerless and hypocritical must we the people have become to allow unhindered bombings of Palestine for decades while doing nothing effective to stop it, meanwhile sitting back to watch a NO FLY ZONE OVER LIBYA be put into place in little more than a week or two? Face it people, we in the West remain staggeringly complacent and falsely inhumane when we allow such hypocrisies to be flaunted right in front of our faces. And so it is that those of us who are still human are compelled to do something. Symbols have power and the extent of that power is derived from the meaning and intensity people affix to the symbols. We intend to create a powerful global symbol made of a message sent directly from the children of Gaza, to the people of the world. Now whether the world listens and responds to these children is yet to be seen, but at the very least we shall send this message. We hope that our photograph captures the message to such an extent that people are motivated to do more. Ultimately seek to have this message heeded to such a point that Israeli aircraft will no longer be able to terrorize the people/children of Gaza/Palestine. And if not, every single time another Israeli bomb drops on the innocents of Palestine, this picture shall be put forward as the demand of a truly sane and humane international community. The true cost of bringing 200 children to the spot to form the human chain is roughly $300 but the minimum amount to request with Indiegogo is $500, thus if we receive $500 or more we will look to bring more children as we must supply travel by bus and a minimum of refreshments for the kids. If the amount we recieve is more than needed to do what we intend to do then the remainder will be given to the Samouni Project. 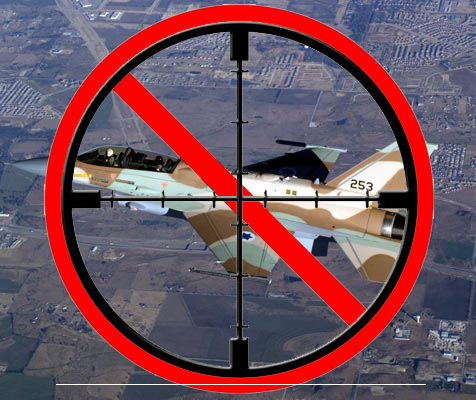 NO FLY ZONE OVER PALESTINE! You are a great man Ken. I hope that more and more people will finally “wake up” and realize the truth about all the injustice taking place in this “democratic” and “civil” world of ours… I also hope that some day I will actually do something instead of just sitting on my chair writing thankful comments to the ones that are REALLY doing some good. April 21 is tomorrow so again Ken offers a brilliant vision ahead of its time! i also add: END the OCCUPATION of GAZA PALESTINE NOW! And because the brutal execution of Vittorio a week ago, multitudes of people have come together to mourn him and celebrate his life and witness dedicated to TJP. AND multitudes of new people are learning about Vik, ISM, Gaza-Palestine, etc. STAY HUMAN! STAY HUMAN! STAY HUMAN! Jewish Schoolbus target practice @ 3 pm! I am interested in you and what you do. I have become less ignorant now that I have read Gaza in Crisis – Noam Chomsky & Ilan Pappe (2010) which was an eye opener to say the least. Through democracyt now and twitter I’ve learned of Your personal story and your amazing work in Gaza. I follow you through my personal twitter: @Chad_V_Estell. Thanks for helping me to see what I can’t find in my regular tv news. What if we could get off of oil? Ever heard of Thomas Bearden? New foundation, a new future. Change the foundation, change the future. May peace come to those you are helping in GAZA. May the Almighty deliver blessings and help to Palestine. this is a documentary, “GAZA-STROPHE”, tv version 52′. A no fly zone will include Palestinian rockets, mortars and laser-guided anti-tank missiles targeting school buses, I presume? Please don’t get kidnapped and killed by one of the factions in Gaza. That might cause a large number of Zionists to die…………Laughing!!!! !